Do you have love handles, flabby arms or belly fat that just doesn’t go how ever much you exercise or diet,? Up until now surgery was the only option. 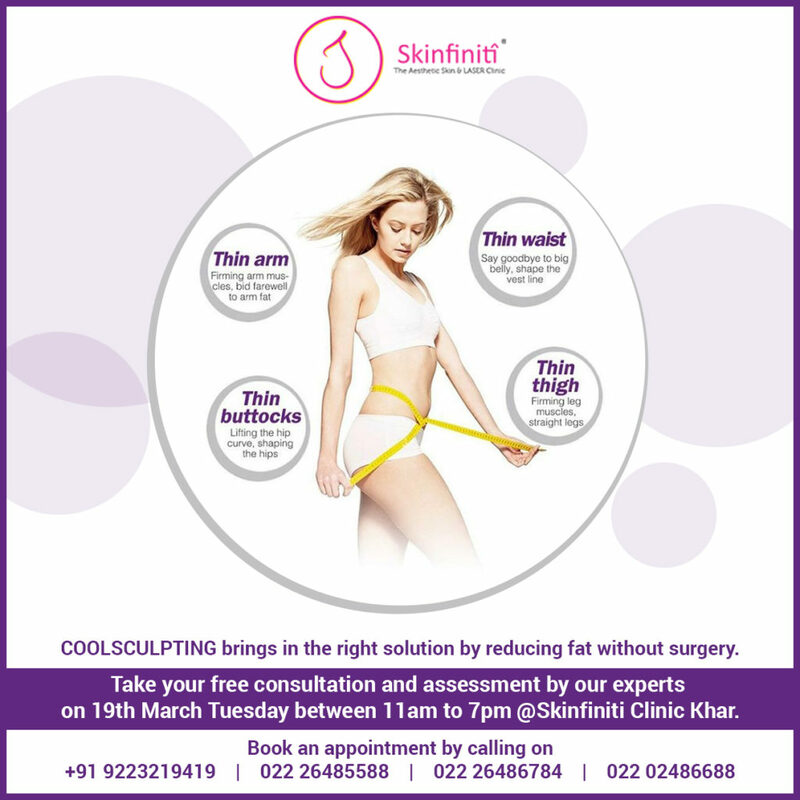 So we at skinfiniti are proud and happy to announce the arrival of exclusive non surgical Coolsculpting by Zeltiq procedure which very few clinics in India have. The Coolsculpting procedure is US FDA-cleared and contours the body by safely and effectively freezing away unwanted fat without downtime or surgery. Who are the Ideal candidates? Those with modest size fat bulges that are not easily reduced through diet and exercise. A specially designed cooling applicator is applied to the desired area of fat reduction. The applicator cup uses a gentle vacuum pressure to draw the tissue between the cooling panels. During the procedure, the applicator delivers precisely controlled cooling conditions that freeze and remove fat cells. The cooling triggers a natural process that on average reduces the layer of fat by 25%. Because the body process to digest fat cells is gradual there are no harmful effect on the liver or kidney. In the weeks & months to follow, your body naturally processes & remove the treated fat cells. Once the fat cells are gone, they are gone for good. When can it b done? Procedure lasts for an hour per area treated. During treatment patients can read, work on their laptop, listen to music or just relax. Yes, you typically do not grow new fat cells as an adult, and the fat cells are destroyed. But you may regain if healthy diet regimen are not followed. Yes. We are typically seeing 20-25% of shrinkage after a single treatment. The results are seen after about 2-3 months, so that is when repeat treatment is usually considered for additional benefit. After the CoolSculpting procedure patients itypically resume normal activities such as work or exercise. Redness may appear in the treated area, and may last from a few minutes to a few hours. Some patients may experience a temporary discomfort in the treated area for 2-3 days. Will I see an instant result? After the procedure, you will be the same size, as it takes a few weeks to shrink. Your fat is actually held inside of cells, which are more or less little tiny packages that enlarge and shrink as you gain and lose weight. During the coolsculpt procedure, about 20% of these fat cells are killed, and they release the fat which is slowly absorbed over several weeks. The fat that is released from the fat cells is no different than any fat that you eat. So it takes 3 months to see a result. Which patient should not be undergoing this procedure? CoolSculpting procedure is Proven,Safe & Effective Non-surgical Fat-reduction Treatment. BOOK your FREE assessment Soon! Take the next step to a slimmer you. The CoolSculpting procedure is the only FDA -cleared,non-surgical fat-reduction treatment that uses controlled cooling to eliminate stubborn fat that resists all efforts through diet and exercise.The results are proven and noticeable. At Skinfiniti, our ethos is to help people be confident in their own skin. We have a team of qualified dermatologists and cosmetologists who customize treatments as per individual patient concern and skin type. Our euqipments are US FDA approved. We have all the state of art lasers from hair removal laser, to resurfacing to Q switched Nd Yag. We are proud owners of Coolsculpt, the only US FDA approved cryolipolysis device for fat freezing. Skinfiniti Aesthetic Skin and Laser Clinic 601-604, Prabhat Chambers, Plot no. 92, S.V. Road, Khar (West), Mumbai – 400052, India. Skinfiniti Aesthetic Skin and Laser Clinic G 62, Ground Floor, Satra Plaza, Sector-19 D,Palm Beach Road, Vashi, Navi Mumbai-400703,India.